I've mentioned the IPython Notebook before (here and here). It's an interactive Python session that runs in the web browser, and can capture and display the output including plots. It can be saved, loaded and exported to a static HTML page. Entries in the notebook can be edited, and the whole notebook can be run in order to regenerate the output. In other words, it's the perfect tool for documenting and presenting an analysis of data, thus bringing us one step closer to the goal of reproducible research. There is one area in which it is a particularly good fit for cheminformatics, and that's QSAR. It's pretty much a complete record of how they went about analysing a particular dataset from start to finish. The only thing that I would add is that I would ask the software used (RDKit, ipython, matplotlib and scikits-learn) to print out their version numbers of the top of the notebook (and add some pretty pictures of outliers too of course). Pretty easy huh? A single line install for 13 or so chemistry packages. Note that this install command should work on any other Linux distribution based on Debian (e.g. Linux Mint or Ubuntu). Specifically, this installs Cinfony 1.1 and all its dependencies (Open Babel, RDKit, CDK, Indigo, OPSIN). Then there's Andrew Dalke's chemfp. Not to mention the 'mols' (Jmol, PyMol, Rasmol) and Avogadro. And let's not forget shameless self-promotion of cclib and GaussSum. There are many other packages of interest; see under Science category in synaptic (see Notes below). Some examples include autodock, ballview, bkchem, and kalzium. Or to max out on chemistry just install the package science-chemistry. (1) If using apt-get to install software is too hard-core for you, there's also a GUI called synaptic. To install, use "apt-get install synaptic". (2) After installation, to actually see what has been installed, use "dpkg -L 'package-name'". For example, anything that was installed in /usr/bin is a new command. (4) Compiling Open Babel oneself works fine but takes 3 or so hours. A similar experience for RDKit has been reported by Jan Holst Jensen. Compiling RDKit is a bit like the recipe for Elephant Soup. It's straightforward, but first we have to compile Boost (as there are no binaries provided for MSVC 2012). Unfortunately, the boost build instructions are very poor. The HTML instructions are full of text, none of which will simply tell you how to get the job done. 1. Just to be safe, as both Boost and RDKit compile against Python, I deleted all my Python install folders except C:\Python2.7. 2. Make sure that bison and flex are installed in Cygwin, and that they are on the PATH. 1. Choose the right version. Too new, and the API will have changed and RDKit will not compile; too old, and it won't compile with MSVC 2012. I'm using boost 1.49. 2. Unzip into C:\Boost\boost_1_49_0. Do not bother using a different folder as it will install into C:\Boost\lib in any case. 4. Start the MSVC2012 command prompt (or else bjam won't find 'cl'). Now we're going to compile the bits of Boost that RDKit needs. Some of these are shared libraries and some are dynamically linked libraries. -- Looking for include file pthread.h - not found. 2. Type "start RDKit.sln", change to Release build, and build the ALL_BUILD target, followed by the INSTALL target. Notes: For a debug build, you need the debug build of Boost. Just replace release by debug in the bjam command-lines above (to speed things up, use 'stage' for both). I was back home this Christmas, and met up with a friend, Johan Hjelm. Naturally the conversation turned to the awesomeness of Python, and whether there was any way to create animated FiPy simulations directly in the IPython Notebook. FiPy is "an object oriented, partial differential equation (PDE) solver, written in Python, based on a standard finite volume (FV) approach." Fair enough. More usefully, there are a couple of examples on the website that model diffusion, electrodeposition and convection. I focussed on the mesh20x20 diffusion example. 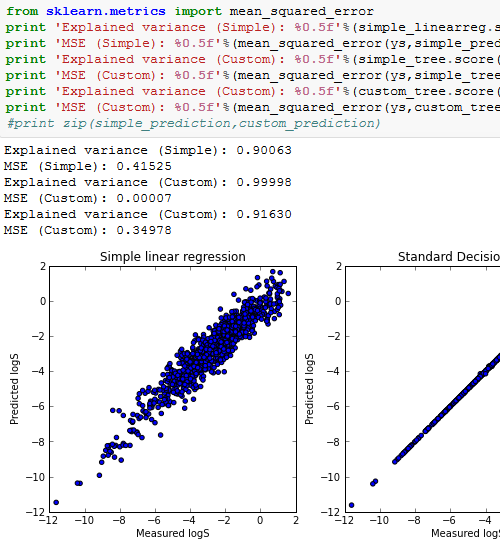 If you run the example at the command-line it pops up a matplotlib window showing the progress of the simulation. However, direct entry of the example into an IPython Notebook just results in a single graph for the simulation. 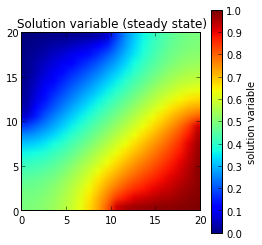 To adapt it, I added a call to clear_output(), and used IPython's display() command to directly display the matplotlib figure associated with the simulation. In short, here are the results as an IPython notebook, a Python script, and as an HTML page (and another HTML page, created on-the-fly from the notebook URL by http://nbviewer.ipython.org). Notes: I used IPython 0.13.1 on Windows. To downgrade the notebook to earlier versions, see this discussion. Also, the statement "from IPython.display import clear_output" may need to be changed to "from IPython.core.display import clear_output". ...I'm going to log in remotely using my laptop over the network. The good news is that there's an ssh server running by default on the RPi. The username is pi and password is raspberry. All we need is the RPi's IP address. Connect the RPi to your router using an ethernet cable. If both are turned on, the router will assign the RPi an IP address. You can find out the value by logging into your router and looking at the details (or you can just guess the IP address by changing the number at the end of your laptop's IP address). Once you have the IP address, you can log in with Putty or Cygwin's ssh (remember, username pi). The first time you log in, it asks you to run 'sudo raspi-config'. I did so, to set the timezone, expand the root filesystem (otherwise it doesn't use the whole SD card), and reduce the video memory to 32MB from 64MB (under "Memory split"). When you hit Finish it reboots, killing ssh, so you have to wait a minute before logging back in. While some believe that the Unix command line is the perfect user interface, let's see what the Raspbian GUI looks like. To do so, we are going to use VNC (Virtual Network Computing), and specifically a piece of software called TightVNC. We will set up a server on the RPi, and a viewer on the laptop. If you set a password, make a note of it. On the Windows laptop, install TightVNC. Please note that when you run the installer, you should untick the box that sets TightVNC running as a Windows service. This would be a BAD idea, as it would mean that your desktop is being broadcast over the network. Notes: From time to time the router changes the IP address it allocates. 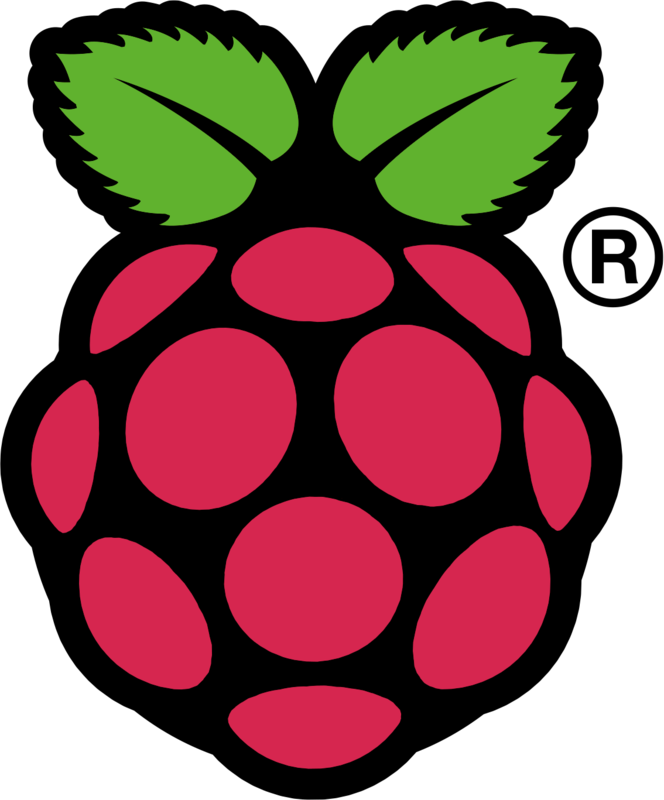 If you want to assign a fixed IP address to the RPi, see the information here (untested). If you want the RPi to automatically start a TightVNC server on booting, see the information in the same article. So you've just gotten a Raspberry Pi Model B for Christmas. 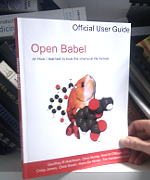 Yay - let's install all known cheminformatics software! But you don't have a monitor, TV or a USB keyboard. What are we going to do? 1. A 5V power supply with a micro USB cable and supplying >700mA. £15 at Maplins - a bit overpriced. You'll probably do better on Amazon, or recycling a phone or Kindle charger. 2. An SDHC card. I bought a 32GB one at ASDA for £15, but you can get by with a 4GB one. Apparently they come in different speeds - I didn't realise this, but your Raspberry Pi might be faster if you get a class 10 SDHC (see list of compatible cards). Getting the Linux distro image ("Raspbian" - a customised Debian) onto the SD card is the hardest part, at least from Windows, as the recommended method is using Win32DiskImager which (as of version 0.6) has a critical bug that might bork your hard-drive (YMMV). I created a Knoppix Live CD, booted off that, and used dd to copy the image to the SD card*. 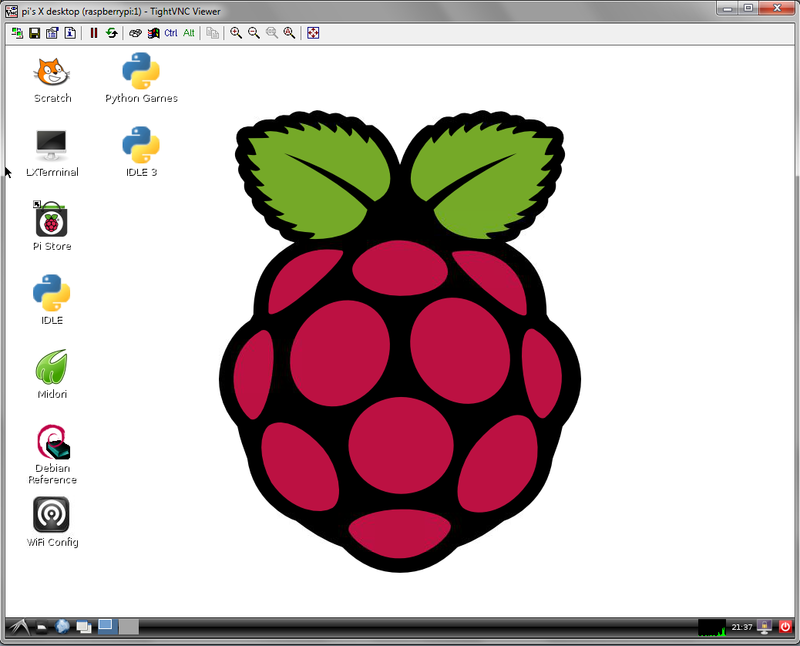 If you don't know what you're doing you might be better off buying an SD card with Raspbian pre-installed. Your RPi is now good to go. Stick the SD card into the appropriate place, plug in the micro USB, and turn on the power. Eh walla!